We are here to support our clients in training and assistance! From the May 2012 issue of American Agent & Broker • Subscribe! For a time in the mid ’90s, James Marek spent his days scrubbing cat urine out of carpets. It wasn’t exactly glamorous work, but after a failed attempt at operating a chain of juice bars, it was a way to pay the bills. Insurance came to him purely by chance when a fellow carpet cleaner suggested he get his insurance license. “At the time, anything sounded better,” Marek said. Now Marek operates Stratton Agency, a global insurance and risk management broker based in San Carlos, Calif. Though most Stratton clients are Silicon Valley-based, it’s licensed in 15 states and shows a growing list of international accounts. Premiums for last year were near $15 million and annual revenue was $1.5 million. Marek started selling insurance for Texas-based United Benefit Life, marketing medical plans to individuals and families. He quickly transitioned from individual to group medical writing. Then in 1999 he began selling P&C insurance and founded Premier Insurance. Seven years later Premier acquired Stratton and assumed the name—hoping to capitalize on the company’s now 98-year history. Along the way, the firm hired Ryan Headley (a former aviation flight school director) and Matt Peterson (a lifelong insurance man). The three now co-own Stratton—Marek handles the books, Headley manages IT and systems administration, and Peterson heads agency operations. In this small firm staffed with only seven employees—three producers, three customer service representatives and one front office person—efficiency is key. Stratton went paperless 8 years ago in an effort to streamline service. Today, policyholders have access to certificates of insurance minutes after purchasing, real-time Skype conferences and efficient home inventory software. 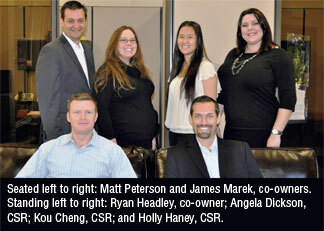 This efficient mindset has earned the agency a Reagan Best Practices designation for the last 2 years, Marek said. Stratton’s book of business is 50 percent commercial, 40 percent benefits and 10 percent personal lines. It represents companies including Hartford, Travelers, Chubb, Allied, CNA, Safeco, Fireman’s Fund, CIG, Oregon Mutual and Golden Eagle, and targets technology companies and high value homeowners. Revenue per employee is about $260,000—more than double the numbers recommended by Best Practices. And despite the soft market, the company maintains continuous growth. In the last 5 years, the Stratton has nearly tripled in value—from $600,000 annual revenue in 2007. Stratton realized how the market slump would affect the agency early on, and accurately prepared for the company’s middle market account premiums to decline. But execs were able to keep Stratton afloat by bringing in enough new business to outrun the poor economy. Peterson said Stratton sees the soft market as an opportunity for growth, because thrifty business owners are more willing to change insurance brokers now than ever before. And Stratton’s paperless environment and full technology suite saves new clients time and money. The company acquired three agencies in the past 2 years—Joe Totah Insurance of Burlingame, Calif., ProWest Insurance Services of Grass Valley, Calif., and Procorp Insurance Solutions in Sacramento. Stratton is continually looking to grow organically, by client referrals and through agency acquisition. Despite recent acquisitions, the majority of Stratton’s new business comes from referrals. To date, the company hasn’t spent a single dollar on advertising. Client referrals, free social marketing tactics and good customer service has been enough so far. But company execs admit technology is the backbone of Stratton’s success, because, Headley said, in Silicon Valley technology is king. The easier it is for a company to communicate electronically, the happier customers are and the more they return business. To facilitate smooth communications, Stratton equips every employee with the latest in office technology, including webcams for real-time Skype meetings, ShoreTel VoIP phone systems and wireless headsets, WebEx for online web and videoconferencing, and DocuSign. The company took its relationship with technology further 2 years ago when it developed ReadyLife—a web-based software aimed at helping clients track home improvements and inventory, and store insurance records and financial records. “I think when you add up all the various ways we have implemented the use of technology really puts us at an advantage compared to our peers,” Headley said. Stratton requires a staff that is young (Marek is the oldest at age 41), fast-paced and efficiency-driven. The company looks for employees with exceptional computer skills, a quality it finds more prevalent in younger generations. “If they are fast on a computer, we can teach them insurance,” Marek said. Stratton focuses on obtaining a stable clientele through the high-end homeowner and middle commercial markets. It’s an ever-changing company looking for long-term relationships. Execs describe it as a company built for change. “By using video conferencing and collaboration tools we are able to make operational decisions quickly and efficiently,” Peterson said. This efficiency then saves customers time and money.